The first thing I did was open up a controller (RAH07). There’s not a whole lot inside, a battery, two banks of DIP switches to set the house and room number, a PIC microcontroller and a radio transmitter module, which helpfully has its part number prominently displayed. A quick Google showed that it was a RTFQ1 433Mhz FM transmitter module made by RF Solutions, who also make a matching RRFQ1 receiver module. Both are available to buy from Farnell, where a datasheet can also be found. 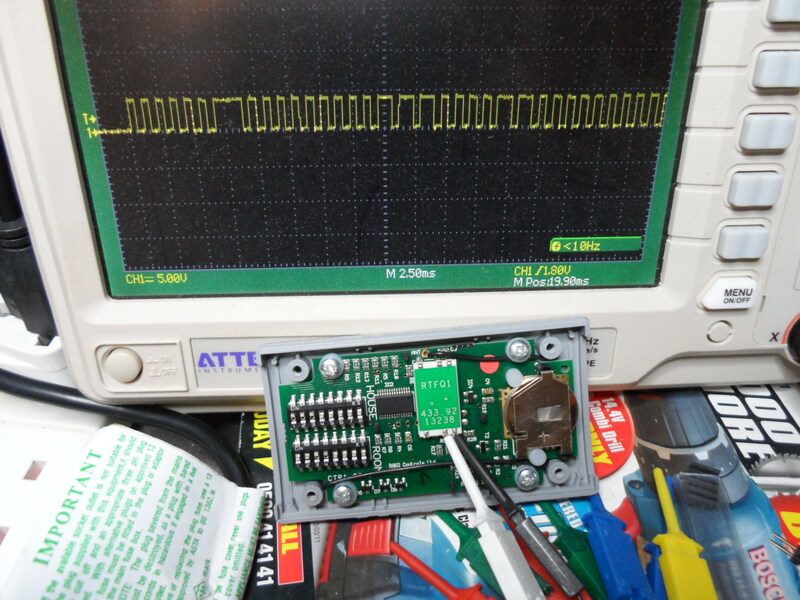 Connecting a scope probe to the data-in and ground pins of the transmitter revealed the output shown in the picture at the top of the page. The controller has seven buttons: Scenes 1-4, Off, Raise and Lower. Pressing the Scene 1-4 or Off buttons resulted in four identical short messages being sent for each press. Pressing the Raise or Lower buttons produced a burst of four messages when they were pressed and another burst of four messages when they were released. The most obvious entry point to deciphering the protocol was the house and room numbers, both the house and room numbers can be set to any number between 0 and 255 and it seemed highly likely that every message was going to include both. There’s also a set of DIP switches that allow them to be changed at will, so the next step was to capture lots of messages with different house and room numbers and to try and spot those in the captured data. It quickly became obvious that changing the house and room numbers was changing the data at specific locations in the message, but it wasn’t immediately obvious how they were encoded. At first I assumed it would be using Manchester encoding, or something similar, due to the way that the data continued to switch between ‘high’ and ‘low’ even when sending all zeros. However Manchester encoding didn’t match and nothing else seemed to either. T is approximately 550uS, allowing an average transmission rate of a little over 700 bits/s. With the discovery of how the ones and zeros of the message are encoded, the rest was fairly straight forward, just send lots of messages, look for what changes and repeat until all of the bytes of the message are accounted for. Preamble of repeated logic zero symbols. So far official RAKO devices have sent either 3 or 6 repeats. Two types of message body have been seen, command messages and data messages. The checksum bit is calculated in the obvious way (obvious because it matches my first guess), simply sum all of the bits of the message body and use the least significant bit of the sum as the checksum bit. Just found your site and I love it! Have just bought a RX / TX pair and am going to try your code.